Sick of arguing with your friends about who is the best player in the NBA? Leading into the ’13-14 NBA Season, Ball So Hard will be putting an end to the debate. Here is the decisive list of the 50 best NBA players. Note: predictions are for the up coming season and rank players on how they will perform in the ’13-14 season. 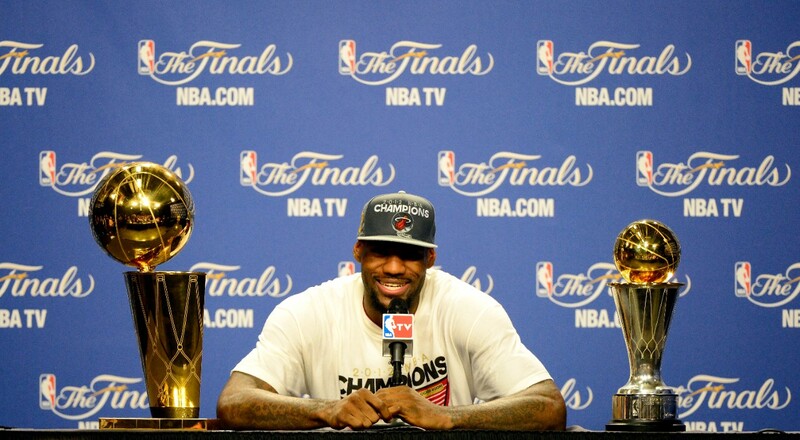 What is there left to doubt about LeBron James? Now with two NBA Championships and two Finals MVPs to his name, LeBron has all but secured his place in the Hall of Fame, and he is still short of his 29th birthday! But all the success LeBron has enjoyed over the past two seasons has still not silenced all of his detractors, rather, they have simply shifted their critical focus. Before the first title, they doubted his ability to push a team over the top. Before the second, they conceded he had what it took to become a champion, but still doubted his ability to win his second. Now he is two titles deep, and the critics have shifted their attention to James’ legacy, “Sure, he is great now, but he still isn’t Michael”. To have your place amongst the all-time greats debated at such a young age, that is the true mark of greatness. The first 10 seasons of LBJ’s career were about proving he belonged in the conversation with legends of the game. His first title was about redemption. His second was an emphatic statement that he was the best player in the world. This season is about establishing his legacy. When you consider what LeBron has already accomplished and his age, it is scary to contemplate exactly how successful he could be once his playing days are over. At only 28, James already has two NBA Championships, two Finals MVPs, four regular season MVPs, a Rookie of the Year, nine All-NBA honours (seven first team, two second), five All-Defensive First Team honours, nine All-Star selections and two All-Star MVPs, two Olympic Gold Medals and a FIBA Americas Championship Gold Medal to top it all off. It didn’t take James’ long to become the leagues best player, earning nearly every ‘youngest player to’ record in the process. And while being the youngest player to reach every major scoring milestone from 1000 to 21,000 points doesn’t make you the best player in the league, it is a great representation of how LeBron has made the most of his god given gifts. No other player in the league is privilege to the physical gifts that LeBron has. On any given night, James is usually both the biggest and fastest man on the floor, which is an unprecedented combination. He is built like a NFL tight end, but runs the floor like a wide receiver. His size – 6-8, 250+ lbs – makes him unstoppable in transition, and his jump shooting continues to improve each year. Last season, he shot a career high 56.5% from the floor – fifth best in the league, and by far the best by a wing player – and hit threes at better than 40% for the first time in his career. He also rebounds at a terrific rate (eight boards per night) and is arguably the best passer in the game – his 7.3 assists per game last season was the second highest average for his career. Throw in a handful of steals and blocks each night, and you have the leagues biggest two-way threat. This season, the Heat have the chance to become only the fourth team in NBA history to make four consecutive Finals appearances. And while there are many questions swirling around Miami this season – how will Dwyane Wade’s knees hold up, which Chris Bosh will show up this season, how will Mike Miller’s absence effect the team, can Greg Oden or Michael Beasley provide any sort of positive contribution, how good are Indiana, Brooklyn, Chicago and New York (and that is just the Eastern Conference!) – the Heat will only go as far as James can carry them. Success does go a ways to silencing critics and doubters, but there will always be those that failure is just around the corner. This season, you can guarantee, just like there was before his first and his second, there will be talk about whether or not LeBron James is capable of winning his third NBA Championship. 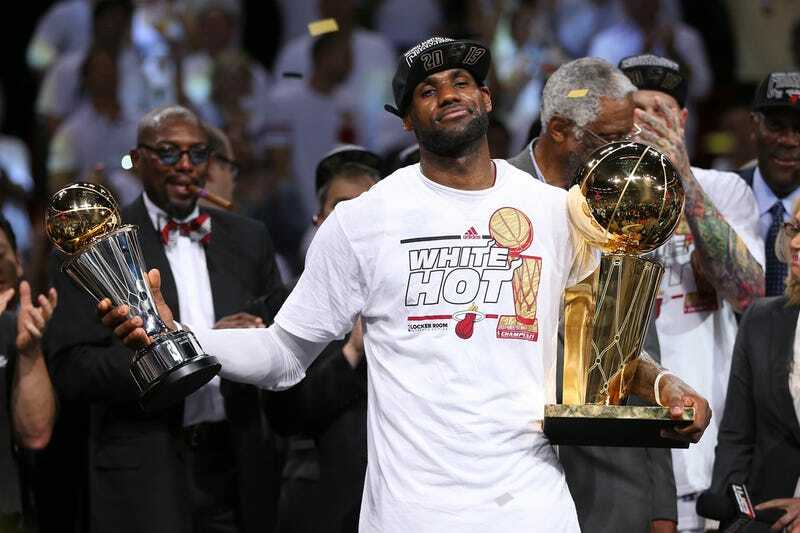 But, like the man said himself, as he cradled his second Larry O’Brien and Bill Russell trophies, grinning from ear to ear, “I aint go no worries”.